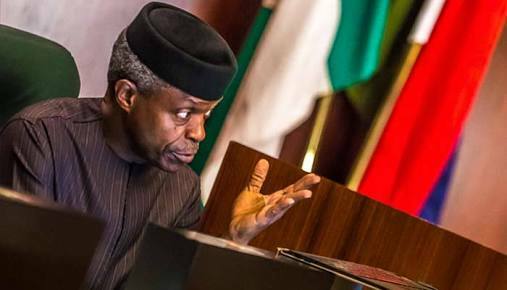 The Vice President, Professor Yemi Osinbajo says that the federal government under President Muhammadu Buhari does not segregate in its responsibilities to states irrespective of religion or party affiliation. The vice-president also said that the Sam Mbakwe International Cargo Airport is the first of its kind in the country, adding that the federal government had given approval for the International Cargo Airport, while it was built by the Imo State Government. Osinbajo spoke while on a courtesy call at the Eze Imo Palace after he had inspected the International Cargo Airport on arrival for a two – day working visit to the State, at the weekend, explaining that the Cargo Airport is an important infrastructural development because of its commercial importance. He said “facilities at the International Cargo Airport are world class. We have looked at how to cooperate even further and certainly we are going to look at how to involve the private sector and bring in other agencies of the federal government in the running of the cargo airport. On the 200 bed ultra modern hospital donated to the Nigeria Air Force, the vice president noted, “this is a commendable effort from the side of the Imo State government, giving a 200 bed well equipped hospital to the Nigerian Air Force for the Imo people. The Nigerian Air Force has the man and materials to manage the hospital effectively for the betterment of the Imo people.